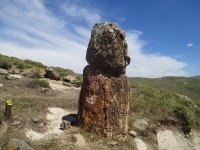 One of the two largest petrified forests in the world, the Petrified Forest of Sigri on the western edge of the island, dates back 15 million years and is protected as a natural monument. A visit to the Petrified Forest of Sigri is a fascinating outing for families with children or for anybody interested in natural phenomena. The Petrified Forest was the result of a volcanic eruption around 21 to 15 million years ago which buried the flora and trees of the region - including oaks and sequoias - beneath layers of ash. Visitors can view 'the Pompeii of the plant world' which features some impressively well-preserved specimens; on some of the trees you can still see leaves and fruit preserved for millennia. Visitors can view the Petrified Forest along three main mountain trails: Trail One is called 'Discovering the Petrified Forest' and is a good introduction to the area; Trail Two, 'The History of the Petrified Coniferous Forest', details the process by which the trees were preserved; and Trail Three, which is the longest, takes people to the tallest standing trunks. In Sigri there is an interesting museum dedicated to the forest which displays some stunning examples of petrified wood and explains the process well.